11 | March | 2012 | Based on truth (and lies). Besides, one does not commit suicide alone. No one was ever born alone. Nor had anyone died alone. But, in the case of suicide, a whole army of evil beings is needed to force the body to perform the unnatural act of depriving itself of its own life. And I believe that there is always someone else, at the extreme moment of death, to strip us of our own life. 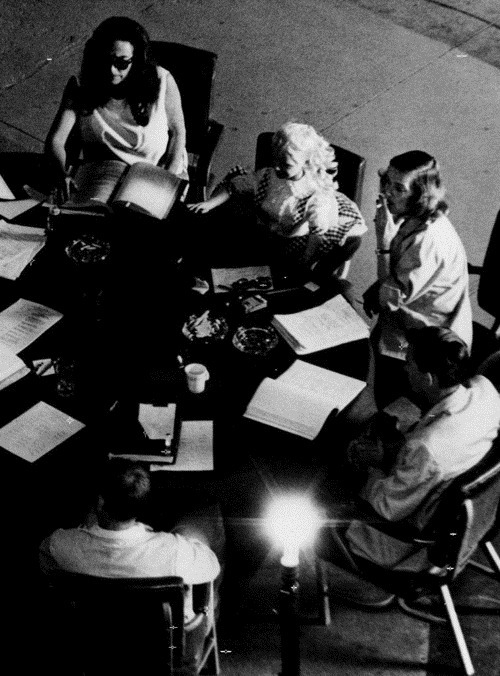 “One day I was given 20 minues to shoot [the Baby Jane reading rehearsal] from the catwalk above. At the time, Crawford was married to the president of Pepsi-Cola. A Pepsi bottle was next to her at all times, and she occasionally sipped from it. Without even looking upward, she sensed my movements on the catwalk – and while reading her lines, she would deftly move the bottle & its logo so that none of the other actors would obscure it in my shots. Leave a comment Posted in CINEMATHEQUE Tagged 1960s, behind the scenes, Bette Davis, Feuds, Joan Crawford, Robert Aldrich, Whatever Happened to Baby Jane?